Enjoy this Bertrand Russell quote? Check out this fascinating video of Bertrand Russell explaining why he’s not a Christian. The only two things that are omnipresent in the universe are hydrogen and fools. how about the Nuts in California? It’s a cognitive bias called the Dunning Kruger effect. Well worth a read..
exactly, i thought of the quote from the yeats poem (“the second coming”). it’s one of my favorites. This isn’t too bad of a misquote, but still, don’t believe any unsourced quotes you read on the internet. The worst offenders tend to be misattributed to Einstein. Honestly he had better things to do then write snarky one liners. Not only is the quote above not misquoted, it is one of his best known quotes. 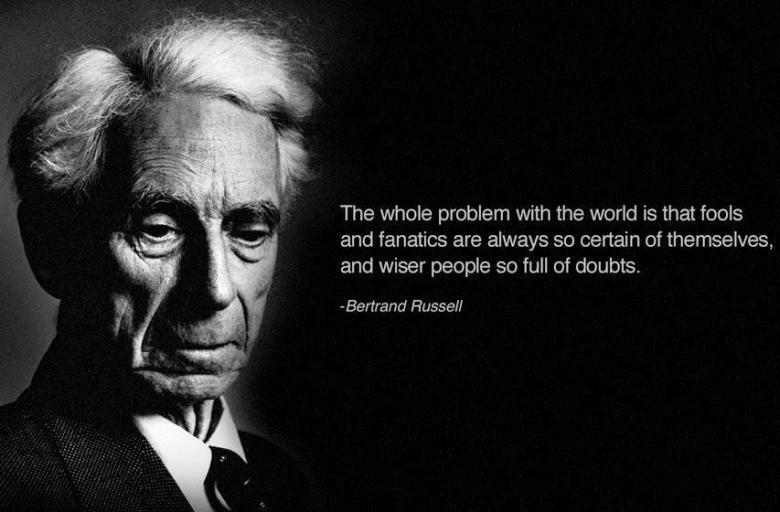 Bertrand Russell has phrased this same idea a number of different way, and the quote above is just one of them. And what you found in your search is just another version of this same thought. I think the quote is very accurate as to describing the nature of doubt. Wise man say: I saved a bunch of money on my ties from Tiecoon. I respectfully disagree , only the weak willed are full of doubts. The wise and strong never doubt themselves. have you SEEN a Republican lately? Please don’t start. I see this more in liberals. Well, we now know on which side of the quote you fall, don’t we? the statement was made philosophically not scientifically. Really? Every three- to four-year-old I’ve ever met was completely certain of themselves all the time, not a shred of doubt in their squishy, weak-willed little heads that complement their fragile bodies so well. Most this country’s so-called leaders behave as toddlers, always claiming to never have a shred of doubt and consistently being proved wrong by statistics, history, and basic math and critical reasoning. ‘Doubt’ is really just evidence of caution. A bold idiot will jump off the face of a 30 foot cliff into unfamiliar waters without a flinch while a wise outdoorsman would likely cautiously check things out first and assess the situation before committing to an action, especially a dangerous one. Mavericks do not equal wise prophets. They’re not even good storytellers (too much grunting and spitting). so every time i’m certain, i’m goofed up…haha…!!!!! I appreciate the humor, but I hope you get the point he was making. Look at the US Congress, so sure of themselves to make the decisions that they do, while plenty of wise citizens aren’t even sure who to vote for. Just an example, please don’t take it the wrong way. i love this site, keep it up . im sorry but i don’t fully agree with that…..it is always good to consider all options but I’m damm certain i can achieve anything i put my mind too and so far im the youngest regional manager in my industry in the UK ever and the only way i got there was hard work and absolute faith in my abilities and techniques! It’s nice you are so successful, but this quote has nothing to do with you. With a bit of arrogance. and this somehow invalidates the qoute? If anything it simply shows you to be the perfect example. I have read everything available that Bukowski wrote, and I don’t recall this line. That’s not to declare it’s a misquote, but a request, if you can provide it, for the source. Thanks. I’d agree here too. This quote is more of a balanced philosopher’s wit and understanding and not the musings of a highly charged drunkard. Hey now, he may have been a drunkard, but Charles Bukowski was an amazing poet with an incredible mind. Don’t tell me you’ve never paraphrased what someone else said without sourcing the original. We’ve all don’t it, but we’re not all as important as Bukowski and we don’t have to worry about getting quoted. Being a drunkard, though not socially commendable, is not in itself a reason to think less of an individual’s work. Alcoholism does seem to be more common among brilliant minds. Few things are so true. Bertrand Russel was almost always right. Russell seems pretty sure that this is the “whole problem with the world.” Maybe he should remind himself of what he preaches. damn dirt, you went an p’d off russell crowe. bad move. Is that what you took away from reading this quote? Seems to say a lot more about you than him. In this words we have 3 parts talking about the(fools,fanatics and wise people) i think we could’t say that becaouse there are different between the fools and fanatics ,but i agree with the last part which talking about the wise people.